"I worked with a decorating consultant who introduced me to Stone One and its design consultant. Once we agreed on the choices, I dealt directly with the company to arrange installation. I was very impressed with their office which kept in contact with us about scheduling and other matters. If I asked a question that the office couldn’t answer, it was referred back to the design consultant and I received an immediate response. For one visit scheduled at our home, the office called us to let us know the crew was running a little behind which we appreciated greatly. For other visits, the team arrived well within the window we were given." "Two technicians arrived promptly and explained what they were going to do. They asked if I had any questions and worked very hard and did an excellent, professional job." "Salesperson was extremely helpful when purchasing. Installers arrived on time, Worked quickly & was very pleasant Looks great." "The crew was on time; came in & went straight to work. Extremely efficient & professional. Even vacuumed up after. Great experience!" "StoneOne showed up on time, work was done as promised in the amount of time estimated and the result is beautiful. Happy with the visit to make the template, the installation process, it was all good. I would use StoneOne again and would recommend them to others." "Excellent job / came out one day and created the template then returned at the appropriate time during cabinet installation to install the counter top. It looks great!!!" "We worked with Sal, who was knowledgeable and very patient, as it took us a long time to decide on the counter material. We needed two slabs and one of the slabs delivered by the granite company was not the one we had requested. Sal took care of the problem immediately, to our satisfaction. He took pains to see that the counters were cut from the portions of the slabs that we preferred. The two installers were also knowledgeable, efficient, neat and pleasant to work with. Stone One communicated with us regarding every step of the process, and gave us all information in writing. Once we selected the granite and sink the work proceeded quickly and on schedule. They were always professional and we are very pleased with the end result." "On the scheduled delivery date, two installers from Stone One arrived on time with the counter top. The main piece was L shaped and weighed about 400 lbs. They carefully put it in place and proceeded to put the other pieces in place and complete the installation. It looked fantastic and joint was barely noticeable. We had originally ordered a 3 inch backsplash, but changed our mind and decided to tile instead. When my wife came home and saw the counter, she was stunned. She could not believe how beautiful it looked and wished that we had stayed with the matching backsplash. The following day, I contacted Stone One and asked if it would be possible to get the backsplash,( but 4 inch instead of 3 inch), and I believe it was Silvana who said she would see what she could do. Later that day, she called and said that they would do it and it would be installed the following week. The same two installers showed up on Dec. 21, as it was getting dark, worked very diligently to fit the backsplash, made some minor adjustments for proper fit, sealed and caulked everything and cleaned up. They were very professional, polite and friendly. It was a pleasure having these people do this job." "Stone one was extremely professional & courteous installation went extremely well and employers were very knowledgeable pricing was extremely competitive." "Installers arrived right on time. They did a great offering of information regarding the product but did the work efficiently. They showed advice on how to locate a problem we had with a cabinet and had the job finished in less than 3 hours." "2 installers were professional, efficient, friendly and informative. A pleasure to have them working at my home. They left my kitchen neat and clean and thanked me for having them do the work. Excellent customer service also as I dealt with Silvana @ Stone One to change something on the work order and she got it taken care of. Very professional outfit and they work WITH the customer. Thank you StoneOne." "StoneOne was 100% perfect each step of the way. On time, presented themselves well, very clean install." "The price we received for the substantial amount of Cambria counter surfaces we had installed was the cheapest around. Aside from a disconnect on timing for the template phase (never showed up when they were supposed to, nothing communicated to us about them being late which they were by a few hours / fortunately our contractor was on site when they finally did show up), the subsequent installation went well. We also had a follow/up for a seam at our sink which had not been sealed correctly at install that they were very responsive in getting corrected." "We are very happy we decided to go with Stone One for our kitchen countertop remodel. Everyone is very professional and friendly. Our sales associate, Tabetha, was excellent. She answered all of our many questions and was accessible by email which worked great for us. All of the scheduling (template, layout, install) was very prompt with confirmation emails for reminders. The installers were very professional and we felt like they worked quickly considering the size of the kitchen. The person that came out to template pointed out an issue with the height of our countertops that would eventually result in a gap with our slide in range. This was extremely helpful to us, since we were able to get this corrected before the actual install and everything looked perfect! We would highly recommend them." "Outstanding quality and service. I wanted quartz and chose the Cambria brand which I highly recommend. It has the widest selection of patterns I found. Most quartz looks like Corian but Cambria has patterns that look like granite. The pricing is a little higher than the standard but there is no comparison when it comes to choice. Great selection of tile in their showroom and I was given lots of time and attention by Tabetha, who was very helpful. They provided a nice sample of the quartz I selected. Installation was done on the day scheduled and the quality of the workmanship was excellent and there were no seams." "FANTASTIC. THOUGHT WE MIGHT HAVE HAD TO MOVE A VENT PIPE BUT WITH A HELP FROM ONE OF THE INSTALLERS WE WERE ABLE TO SET THE SINK. IT COULD HAVE BEEN AN ISSUE BUT THANKFULLY IT WAS NOT. WE ONLY HAD TO MAKE THE DRIVE TO METHUEN ONE TIME IN ORDER TO PICK OUT GRANITE. COMPLETELY SATISFIED." "Overall satisfaction with StoneOne is excellent!" "They came to my house 2 weeks before the install & measured and set the date and time for installation. On day of the install they called and notified they were running late but would still be there. Once on site they installed the counter top quickly and professionally. Before leaving they removed all there construction materials and went over how to clean & keep the top." "The installers were exactly on time. They were polite, professional & courteous." "Everyone we encountered at the company was knowledgeable and professional. All estimates, work descriptions and instructions were in writing, and we were called prior to each appointment. Sal was the coordinator for our project and he was responsive to any questions and concerns we had. He was able to resolve a problem with the wholesaler regarding one of the slabs. Everyone involved seemed to make an effort to get it right/ from making the templates, to fabrication, demolition and installation. We are enjoying our new counters and would definitely recommend StoneOne." "Once we had our bottom cabinets installed, we called them for as date to come out and measure. They gave me three dates. One to measure, one to pick out area on the slab, and one to install. They came to measure on a Friday, On Monday we went to their location, and we picked the area of the slab we wanted. They taped the area from the template, so that we could see exactly what that section would look like. The following week, on Tuesday, they came and installed. All workmen were very pleasant, did an excellent job, and no mess was left. All appointments went as scheduled. We are extremely pleased." "Sales staff was very helpful and professional. Many competitors that I visited didn’t take the time to help with selections and design. StoneOne was helpful, knowledgeable, and most importantly patient during that process and they had many styles/colors to choose from! Pricing for granite and tile was very competitive and fair. The only reason I gave a "good" rating for the pricing category was because distributor’s shipping charges were high and they were passed along to the customer. Their in/stock granite selection was great as well!" "We started by visiting their showroom. Service was prompt and very informative, and they showed us their on/hand granite slabs. While their granite selection is good, we opted to go to one of the nearby granite supply warehouses since we’re ultra/picky. They had no problem with this once we found whatwe wanted and warehouse sent them the info they needed. Estimate was quick and professional once we sent them our dimensioned kitchen plans. Installer came out once cabinets were in place to do measurements and plan out exactly how we wanted it. He was great, providing some useful tips in planning certain curves, etc. Counters came in about a week after and installed flawlessly. Absolutely no issues, and we love our counters. 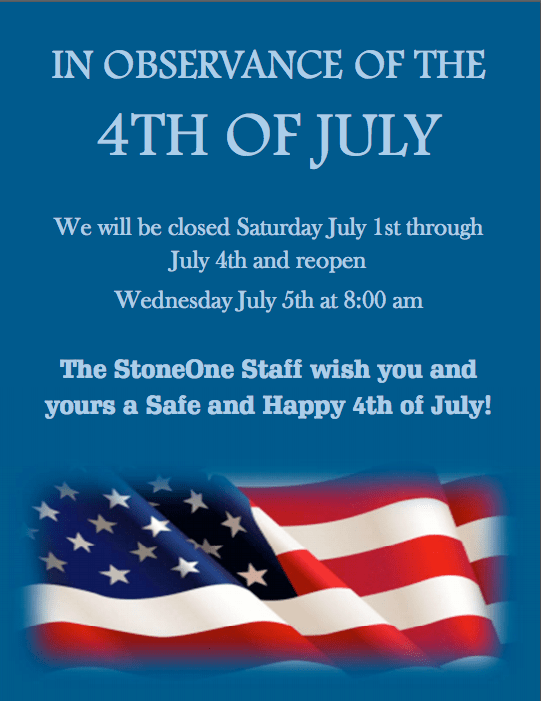 Would definitely go to StoneOne again next time we need counters or anything granite." "This installation was part of a cabinet refacing project through another company. I gather they use Stone One a lot and I can see why, we have nothing but good things to say about them. The owner, Silvana was especially great to work with. We selected a sink they provided, a 16 gauge ‘banjo’ style. We had a minor problem with this, but it was mostly our fault and totally a verbiage issue. We were calling it one thing while they called it another but we were talking about the same sink all along. We stressed out over nothing and Silvana was very patient with us throughout the process. With quartz, some people don’t think you have to view the slab before cutting because it’s more consistent looking then granite. We wanted to see it and choose the part used on the peninsula part of our kitchen. Again Silvanna was great on this and met with us at their location to view the slab and pick the part we wanted for this particular part of the countertop. The guys who came to measure were terrific. We talked about where I wanted the seam. They also talked to us about various options we might want to consider, like cutting the countertop nearest the fridge a little smaller so that it could be flush up against the cabinet above (never thought of this and it does look better). The two guys who installed our countertop did a great job as well. I think most people worry about the seam showing on a long countertop, we certainly did. They did such a good job with the seam that it’s hard to find without knowing where it is (and even then you have to look hard). They did a great job on the backsplash seam as well. They obviously knew what they were doing and did a fantastic job. Throughout the process Stone One called and told us when they would be at our house and they were always on time. We are very happy with the countertop and the service we got from Stone One."